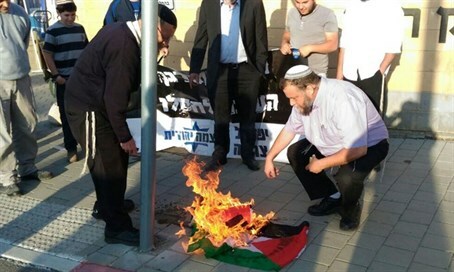 After IDF soldiers jailed for burning PLO flag, rightwing activists hold demonstration in front of IDF HQ, burn PLO flag. A day after the IDF punished two soldiers for burning the PLO flag at the Awarta checkpoint near Shechem, rightwing activists demonstrated in front of army headquarters in Tel Aviv, burning the PLO flag and proclaiming their support for the two jailed soldiers. On Wednesday, Arab witnesses observed soldiers burning a PLO flag near the Awarta checkpoint, near the Huwarra army base south of Shechem. The witnesses filed a formal complaint with the IDF over the incident. The army acted swiftly to punish those involved in the incident. One soldier received a 28-day jail term, while the other, a squad commander, was stripped of his command and given 20 days in jail. Some nationalist activists, however, were none too happy over the army’s response to the incident, blasting the rush to condemn the two soldiers. On Thursday, rightwing activists gathered for a demonstration in front of the Kirya army base in Tel Aviv, which serves as IDF headquarters. The demonstrators were led by former MK Michael Ben-Ari (National Union), Hevron activist Baruch Marzel, and Lehava founder Bentzi Gopshtain. All three activists are former members of the outlawed Kach party, which was founded by Rabbi Meir Kahane. During the demonstration, participants torched the PLO flag and praised the soldiers involved in Wednesday’s incident. Ben-Ari condemned Defense Minister Moshe Ya’alon (Likud) for the rush to punish the soldiers, calling him “confused” and saying that he was acting against his own soldiers. The PLO flag, which was banned in Israel for decades as a terrorist symbol, was legalized as part of the Oslo Agreement in 1993.